PhD Candidate Csongor Mark Horvath presented the current research results on the system for advanced monitoring of industrial robotized processes developed by PPM and its partners Yujin Mechatronics and the Kyungpook National University (KNU) in South-Korea, the Institute for Factory Automation and Production Systems at Friedrich-Alexander-Universität Erlangen-Nürnberg (FAU) in Germany, the Budapest University of Technology and Economics in Hungary, and the Arctic University of Norway (UiT). The installation of industrial robot systems requires considerable human efforts during the mechanical and electromechanical setup. This causes high costs due to the need in human presence. The PPM researchers propose a controllable sensor system for enhanced remote process monitoring. The system is decoupled from the process tool and can therefore be controlled independently. It constantly provides the machine operator with updated process information. 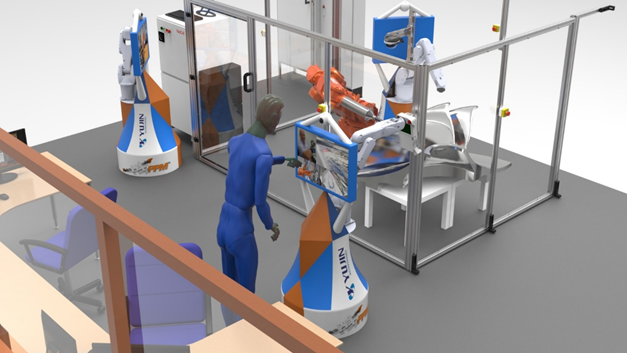 The concept is applied to an autonomous sensor robot monitoring an industrial robot system for heavy, multi-pass TIG welding of voluminous workpieces.